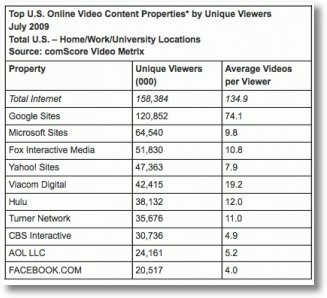 Watching Online TV and video is exploding with massive increases in viewers according to Comscore. The viewing figures for online streams soared to new heights last month (July), with over 158 million Americans(over 80% of the population) watched 21.4 billion videos in July setting a new record. Although watching online tv has been growing for some time, around a year back the figures for online video seemed to have levelled. But since April, close to 24 million more users have become regular online video watchers, according to comScore. Since then, online video viewing has become all the more mainstream, in July 2009, 81.0 percent of the total U.S. Internet audience viewed online video, up from 73 percent in April of 2008. The average user watched 8.3 hours of video content last month. Surprisingly although summer was expected to see a reduction in viewing figures, the opposite happened. As was expected, Google sites—which include YouTube dominated the video category in July, accounting for 42 percent of all videos streamed during the month (8.9 billion videos overall). Viacom Digital came in a distant second with 812 million video streams, or 3.8 percent of the market. When looking at unique users, Google won again, reaching 121 million unique viewers, versus 64.5 million uniques for second placed Microsoft. Mega popular Hulu reached 38.1 million unique users, good enough for sixth place in the category. To put Google’s dominance in perspective, YouTube’s audience averaged 74.1 videos per viewer in June, per comScore, versus 12 videos per viewer for Hulu’s audience. However, to Hulu’s credit, while the average online video consumed during the month was 3.7 minutes, Hulu viewers on average watched 1 hour and 13 minutes of video content on the site. Any rise in online stream viewers is welcome, but also expected with the growing popularity and growth in video and tv content providers who are creating an online presence.